We include dye structures as chemdraw files, plasmid maps as annotated APE files (It’s free, download it here, thanks to Wayne Davis), and dye spectra as comma-delimited text files suitable for import into excel. Protocols included are best-practices, and may be more up-to-date than previously published methods. Surface selective labeling is achieved by adding a cell-excluded dye to living cells in a physiological buffer. Labeling is essentially instantaneous, if dye is added at mid-nanomolar concentrations. Prepare working stock in cell culture media at 50 uM (100-fold). Add to cells in culture media (10 uL per 1 mL) to achieve final concentration of 500 nM dye (0.01% Ethanol final). Image or measure within 5 min (to ensure surface only and not endocytosed material is stained). Depending on the surface residence of your target, you may perform labeling on ice to prevent internalization. Surface selective labeling is achieved by adding a cell-excluded dye to living cells in a physiological buffer. 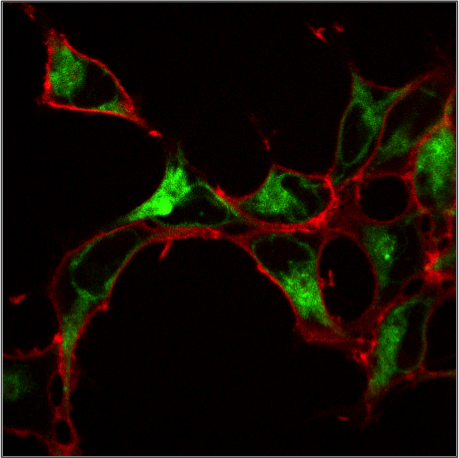 After equilibration for a short time, a distinctly colored cell-permeant dye is added to label non-surface expressed FAP sites. Labeling is rapid, and dye does not need to be washed out to achieve selective labeling. Prepare working stock in cell culture media at 50 uM (100-fold). Add MG-B-Tau to cells in culture media (6 uL per 1 mL) to achieve final concentration of 300 nM dye. After 5 minutes, add MHN-ester (6 ul per 1 mL) to achieve a final concentration of 300 nM dye. After 5 minute incubation, analyze by imaging or cytometry using Alexa-488 (inside) and Cy5 (outside) detection settings. Depending on the surface residence of your target, you may perform labeling on ice to prevent internalization. 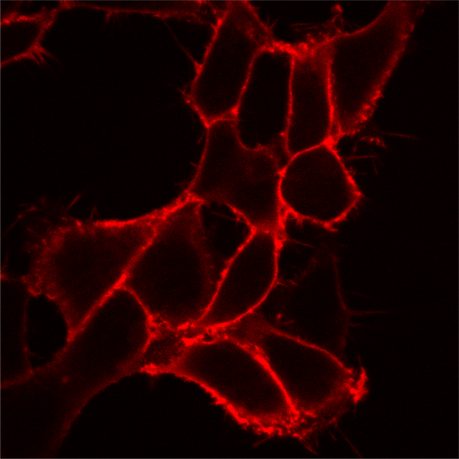 Total protein pool labeling is achieved by adding a cell-permeant dye to living cells in a physiological buffer. 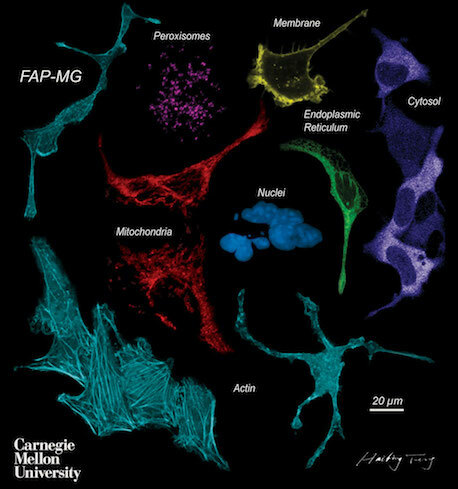 After equilibration for a short time, cell-permeant dye penetrates the cell to label intracellular expressed FAP sites. Labeling is rapid (10 min), and dye does not need to be washed out to achieve selective labeling. Prepare working stock in cell culture media at 50 uM (100-fold). Add MG-ester (or MHN-ester) to cells in culture media (6 uL per 1 mL) to achieve final concentration of 300-500 nM dye. After 10-20 minutes analyze by imaging or cytometry using Alexa-488 (MHN-ester) and Cy5 (MG-ester) detection settings.